Pronovias Mandal Wedding dresses features a intricate lace soft fishtail with v-neck detail at front and modern illusion back detail. 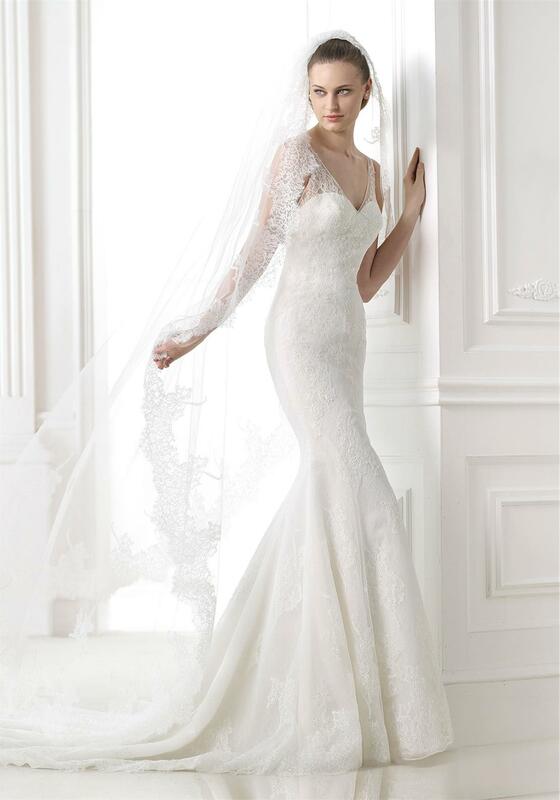 All measurements are approximate and given in inches, according to the Pronovias Size Chart. Please note that most of our sale dresses are samples from our main collection and have been on display in our showroom. Gowns may have been tried on in-store and show signs of handling including loose threads/beading and marks inside. This is to be expected when buying an ex-sample dress and you may wish to have your dress dry cleaned or mended after purchase to restore it. The condition of each dress is reflected in the price, any major defects will be noted in the description. If, for any reason, you wish to return your dress, you may do so within seven days of receipt.